This enigmatic basket is made of black ash splints for the body and basswood fibers for the details. The maker and intended purpose of this basket are largely unknown. 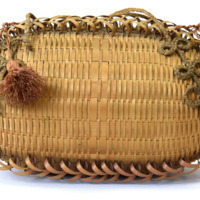 The purse-like structure and Victorian-style detailing speak to the influence of Western femininity on indigenous women.